This duck stock calls for meaty duck necks, carrots, onions, and thyme. Once reduced, it becomes a luxuriously rich jiggly stock. Quick. What comes to mind when you think of stock? Sadly, a lot of us think of tin cans or waxy boxes. From their shiny, happy faces, the packages shout “All-Natural,” “Lower Sodium,” Rich-Tasting.” But then I take a swig—yes, I swig broth—and the truth is revealed. Sure, some are, indeed, lower-sodium—when compared with a salt lick. But the murky liquid inside is a flatliner, one with nary a pulse of flavor, despite being riddled with octosyllabic ingredients that sound as if they belong in automobile lubricant. It doesn’t have to be that way. Homemade stock, simmered for hours with as many bones as you can cram into the pot, isn’t only trés facile to make, it’s a thing of beauty, filling the house with the unmistakable scent of nostalgia. Standing in front of that burbling pot, the steam opening your pores and filling them with its animal essence, you have a sense of purpose. You feel like one of those earnest people in wartime posters, wrench in hand, ready to defeat the Axis powers and be back at the table in time for dinner. In my case, dinner is our annual cassoulet party. A casual affair, the party was started years ago by friend and LC recipe tester Cindi Kruth after one of those cloud-parting, angels-singing epiphanies in France when she first tucked into a crock of slowly simmered beans, sausage, and duck confit, all melded together by, of course, stock. Since then The One and I have had the pleasure of being invited several times to sit at her table, shoveling bowl after bowl of her marvelous creation—a recipe she’s been perfecting since her Divine Intervention—down our gullets. This year, though, thanks to dwindling numbers of guests and her dwindling waistline, she handed the duck fat-slicked baton to me. “Your turn,” is all she said. Fine, I thought. Imaginary wrench held high, I vowed to make a cassoulet for the ages. And that’s how I got the crazy idea to make homemade duck stock. Ah, but not just any homemade stock. A stock that was intensely flavored, rich, and gelatinous. A stock so lovely, it would be a shame to cook with it. An über stock. That meant getting hold of a hell of a lot of duck bones. Meaty duck bones. (Both meat and connective tissue contain collagen. When gently heated in water, the collagen dissolves, causing the stock to turn into shimmying jellied gold.) Not having a freezer filled with duck parts meant one thing: a call to D’Artagnan. Although mostly sold to restaurants, meaty duck necks—the prima ballerina of stock ingredients and soooo much better than strip-mined duck carcasses—can be had for a reasonable price. Call and say, sotto voce, that David sent you. The only problem? The duck necks come exclusively in 25-pound boxes. Nothing tests your stock-making resolve like a 25-pound box of frozen fowl. I was worried that the hardest part of my endeavor would be justifying to The One why I’d bought a box of duck necks the size of a library desk with our joint credit card. He just shook his head when he saw me stumble into the house—the resigned shake that only years of slamming into an immovable object can produce—and slumped out of the kitchen, muttering. But that was piffle next to figuring out what I was going to do with all those necks. After seriously questioning my deductive reasoning, I ferreted out my dusty canning pot that has doubled as a washtub at times. Then I heaved it and a pasta pot onto the stovetop. Those, I was sure, would be big enough to accommodate all the bones. I decided to first ratchet up the flavor quotient by roasting the necks in a hot oven. I wasn’t sure what to expect but found myself dancing a happy jig when I noticed crusty, caramelized bits forming in the roasting pan. That drew The One into the kitchen, just like the giant animated aroma finger that beckoned Sylvester the Cat. Suddenly, my credit-card charge doesn’t seem so foolish after all, does it, mister? I loosened up the cracklings with a splash of water and dumped all that browned goodness into a waiting pot of cold water. He grew more curious, moving in closer, but I pretended not to notice. A little punishment never hurt anyone. I resisted the urgings from cookbooks and chefs to add shallots, leeks, and onions to the pot. Or tomatoes and tomato purée. Or handfuls of sage, thyme, rosemary, and marjoram. Too much trumping up, thank you. I wanted a duck flavor so unadulterated, its feathers would seem to flutter on your tongue. I settled upon onions and carrots for an undercurrent of sweetness, garlic for the wee-est bite, and a tiny, tiny amount of tomato paste for a hint of umami. Fini. Acabado. Done. Then came the simmering, which isn’t my bailiwick. I do few things at a simmer. It’s just not fast enough. I don’t even simmer at a simmer but rather at a moderate boil. Patience, darlin’, thy name is not David. But I knew that anything more than a slothful burble, the kind that sends up bubbles so infrequently it forgets what it’s doing, would cloud the stock with a foam of impurities from the meat and bones. So down went the heat and up went the spoon as I stood there, waiting, waiting, waiting for the scum—such an unfortunate food word, scum—to form and get all that grossness the hell out of there. Fidgety, I contemplated cranking the heat to a boil more than once, but that would only have defeated the purpose of skimming for scum. So after watching almost all of the new Jane Eyre film on DVD, I was finally in business. Add another six hours, almost all of it unattended, and I was rewarded with eight quarts of a stock so flavorful, so rich, so “watch it wiggle and see it jiggle,” that even Cindi, the sitting Queen of Duck, deemed it the best she’d ever tasted. It seems a coup d’état is brewing. 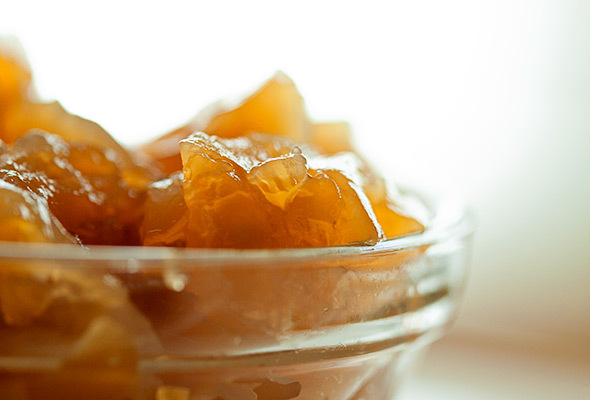 The image you see may seem to resemble a bowl of duck Jell-O more than duck stock. But actually, they’re one and the same. Sort of. Behold the glory of an über-stock whose every molecule is imbued with collagen, that gelatinous substance that makes gelatin—or Jell-O, if you will—wiggle, jiggle, quiver, and shimmy. (This wiggling, jiggling, quivering, and shimmying is much like what happens to your thighs when you, like David, bust into an impromptu happy dance over the superlatively rich, ducky smack of this stock.) Worry not: The wobbly blob of stock turns liquidy when subjected to mild heat. All the better for you to make a ducky take on pho or toss in some carrots and turnips and potatoes and deem it a duck pot au feu. The sort-of-solid stock freezes well, too, which gives you ample time to ponder what to do with the rest of your stash of duck stock. Er, über-duck stock. 1. Slide an oven rack into an upper third position and another into the lower third slot in the oven. Crank the heat to 400°F (204°C). 3. Line two rimmed baking sheets or roasting pans with aluminum foil. Dump a few big handfuls of duck necks onto the pans, drizzle them with some of the oil, and toss to coat them well. Place the necks, side by side, in a single layer. Any extra necks will have to wait for the next batch. 4. Roast the necks, turning them several times, until they turn a deep mahogany and the bottoms of the baking sheets are glazed with anatine goodness, 45 to 60 minutes. 5. Meanwhile, find a very, very, very large pot. Barring that, two large ones. Using tongs, transfer the necks to the pot(s) as they come out of the oven and forget about them while you roast the rest. I ended up with nine baking sheets’ worth of necks; they took quite some tIme to roast, although it was mostly unattended. If you like, when you’re done roasting, slide the empty baking sheets on top of the stove and turn the burners beneath them to medium. Drizzle in a little water, scrape up the bits with a spoon, and pour the liquid gold into the pot. Every bit counts. 6. Add enough cold water (not warm or hot but cold) to cover the necks by several inches. Bring the water to a gentle simmer—the kind that sends up fairly steady columns of lazy bubbles—and let time work its magic. Skim any scum that forms on the surface. Depending on the size of your pot, this will take anywhere from 1 to 2 hours. 7. Once the scum has pretty much been removed, add the onions, carrots, thyme, garlic, and tomato paste to the pot (or divide them between the two pots). Let the stock burble until the meat easily pulls away from the bones, 4 to 6 hours more. Keep an eye on the pot so the bones and vegetables remain submerged. If the stock level drops too much, pour hot water into the pot. 8. Place a colander in a bowl or pot large enough to hold a vast quantity of stock and carefully pour the stock into the colander to catch the large bits and bobs of meat and bone. (Watch out, it’s hot!) Toss out the contents of the colander, because if the stock was cooked properly, the liquid will have leached every last iota of flavor from the meat (although the remnants did make a great meal for our Devil Cat, Rory). Wash the pot well and set it aside. 9. Line a fine sieve with several layers of paper towels and place it over the pot. Slowly pour the stock through the sieve. Let the stock filter through, without pressing on the paper towels. If you’re a perfectionist or simply like a perfectly clear, shimmering stock, you can repeat this step once or twice. The stock will still be hot, so set aside the pot until it’s cool to the touch. 10. Pour the stock into resealable plastic bags and place them in the fridge until you need them. The stock will last up to a week in the fridge or 3 months in the freezer. You can also pour the stock into ice-cube trays and slide them into the freezer; when they’ve frozen, pop them out into resealable plastic bags—though I don’t recommend doing that with all 8 quarts of stock. Duck Stock Recipe © David Leite. Photo © David Leite. All rights reserved. All recipes and photos used with permission of the publisher. Wonderfully written article and a beautiful picture of the gelatinized duck demiglaze. 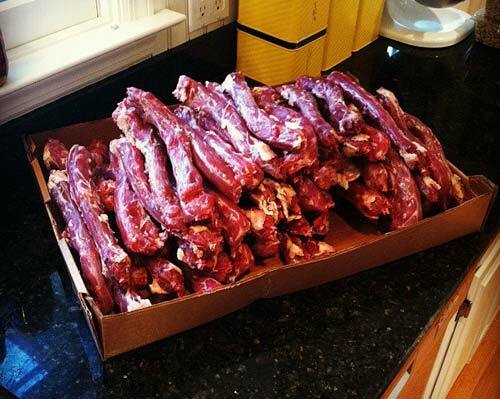 Only folks who live in your “neck” of the woods could find pounds and pounds of duck necks. I buy a couple whole ducks, like really whole ducks, at a local Asian market and roast them down for the fat. I then cut them up and braise them with Asian seasonings. Love duck. Well, Stu, I’m with you; I love duck. And your braise sounds great. BTW, D’Artagnan ships everywhere. And the bones are something like $25 or $30–for all 25 pounds. And they’re so incredibly meaty. Here’s the batch when I got it. Wow. I am so happy I just found this because there’s nothing I love more than duck. Thank you! Amateur Bot-ann-ist, you’re more than welcome! I hope you enjoy it. Oh, huzzah! Another day made better by a post from you! Why, thank you, Beth. I had a blast making it. and I, too, now can’t get that song out of my head. So I added it to the post, up top! Ha! Yes, you did! You’re so great. Couldn’t find duck necks at D’artagnan’s web site. Greg, that’s right. They’re not a regular item. if you roll over the links above, they give you the number to call: (800) 327-8246. There’s a special Leite’s Culinaria price of only $26.99. Interesting that you use duck necks. I make turkey stock from turkey necks the day before Thanksgiving every year and use it for gravy and stuffing. While I bake, make cranberry chutney, etc., I check every now and then to see if the liquid is simmering just so. I don’t have children, but it feels like checking on my sleeping baby to make sure she’s breathing…. When I use leeks I save the green ends and freeze them, and later grab a handful to add to whatever stock I’ve got simmering. It takes forever to make good stock, but boy, what a reward at the end! Chiyo, I like the analogy of a stock being like a sleeping baby. You let it do its thing, but you always have an ear/eye out to make sure it’s taken care of. And, yes, nothing, nothing beats a good, flavorful stock. BTW, I spent many a happy weekend at the Memorial Art Galley as an art student at the Rochester Institute of Technology. The Sitting Queen of Duck chiming in here. I, too, made my own duck stock in years past. Alas, always of the “strip-mined duck carcasses “ sort. Decent enough. Never ever has there been a duck stock like the one David perfected this cassoulet season. A mere seven ingredients, plus a little water, and patience (the hardest part for some of us), then …bliss. I saw those bones and EUREKA. Neck bones. Of course. And so many. And so succulent. Let me tell you I could eat the stuff with a spoon. Cold. Oh wait, I did. (Yeah, you should be jealous.) No need for a coup; I humbly bow and pass the crown to David, the new Queen of the Duck. Well, my oh my, Cindi! I’ve been called a queen before, but never with such reverence. Thank you. If it weren’t for your passing the baton, I never would’ve even attempted this. So, as the newly crowned Monarch of Fowl, I dub thee Lady Cassoulet. Lovely essay…and the recipe is written in a style that would make Judith Jones proud. Couldn’t help but think of my ex when I read the first 8 Wwords of Step 7. Nyuk, nyuk, nyuk. Now I’m wishing for the cassoulet recipe too. Gonna share? Well, there is no greater compliment than hearing my recipe would make Judith Jones proud. (Dianne Jacob, are you listen?” It’s interesting that you wrote that because 14 years ago, she gave me a piece of advice: Make your recipes come alive with strong verbs and personality. I’ve never forgotten that. And, indeed, nyuk, nyuk, nyuk about your ex. Scum eh? Can’t wait to try this! I love your writing, especially your references to “The One.” My husband is always questioning when yet another box from D’Artagnan arrives–but is always thrilled when it turns into dinner. Hello Jac, I hope you like the stock. Ah, and a fellow D’Artargnaner. You figured out the antidote to those questioning looks and shakings of the head: make something astounding and they’re too caught up in their own dining reverie to remember their doubt. What a completely gorgeous stock, David! I would not jump to assume that descriptor about stock but I agree completely on the difference of purchased vs. homemade stock. It is a different creation completely. The use of duck necks is genius. When I started to read I was imagining the sad remains of duck we’ve prepared and the thought of the stock from them was not so lovely. Another rich post from you. And of course I’m secretly hoping it is the first stone on the path to cassoulet, an all time favorite dish for me. Such a labor of love it is! Hi. Toni. Thanks for the kind words. And, yes, a recipe for cassoulet is coming. In fact, I’m working on it now. But it’s a long one…. Thank you, thank you! I have always wanted to know how to make a true stock- not salt water. I simply loved your description & you inspired me to get my bones out. Michelle, NOTHING maked me happier than hearing the post inspired you. So go out there and start stocking! Hi, please can you clarify a point for me? If the duck necks were initially frozen and then cooked, can you refreeze the stock? I was always led to believe once something is defrosted it shouldn’t be frozen again? Hi Ellyn, absolutely no problem with freezing the stock. That no-freeze rule, as far as I was told, refers to defrosting an item–say meat–and refreezing it uncooked. This takes frozen necks that are used in the stock and then that stock is frozen. It’s the same way we often buy pork sausage when it on sale and freeze it. Then we make a chili with it, eat some, and freeze the rest. I am currently simmering Batch #4 of chicken stock (total count: About 12 quarts — welcome to having 24 people for Seder! ), and I have become a stock junkie: There is something so incredibly pleasant about allowing time (my favorite kitchen ingredient) to transform stuff that is all but trash — bones, gnarly bits, feets (my secret ingredient) — into that lovely golden stuff. And you’re now inspiring me in the Ducky Department. A month ago, 25 pounds would have sounded daunting. Now? HA! I LAUGH at your 25 pounds! I bow down to you, Maggie! I am not worthy, I am not worthy!! I have a stock question. For years, I have made chicken stock, and for years, i have been disappointed. I have followed one recipe after another, and they all said the same thing — chicken (bones or whole or parts) plus aromatics, plus simmer for 2 or 3 hours. And every single time I wound up with an insipid, nearly tasteless liquid, maybe one step up from a very virtuous sort of herbal tea. I followed the same sort of recpe for Batch #1 (see above) and then decided NO. NO MAS. This is an insult to the pot. So I put the usual stuff in, but then I added maybe 2/3 of the recommended amount of water. And THEN I simmered the stuff not for two hours or three, but for a solid twelve. The result: Fabulously delicious, golden liquid, doesn’t even need a speck of salt. So here’s my question: WHAT IS WITH ALL THE SIMMER FOR TWO HOURS RECIPES? I have tried enough of them to be quite certain that it’s not that I am somehow getting weak, insipid chickens. That’s simply not enough time to develop any flavor or body. So…..what is the story? Any ideas? Maggie, the simmering is a way of extracting all the flavor from the meat, bones, and vegetables as well as reducing the stock. My guess is you might not have simmered it down enough to concentrate the flavor. I usually reduce my stock by half. I’m just wondering why so many recipes — and from well-respected sources — do the two-hour thing, without any mention of further reduction. Maggie, that’s a good question. But the important thing is: You now know the secret! And if you want to totally geek out, reduce it really significantly, and you’ll have a rich, gelatinous demi-glace.